Cloth doll designer, teacher and 10 year sponsor! Doll artist specializing in African-American images ranging from the whimsical to the natural and from baby dolls to grown-ups! A big Thank You to our judges (listed on left), all the online voters and the dollmakers who entered our 10th annual challenge! 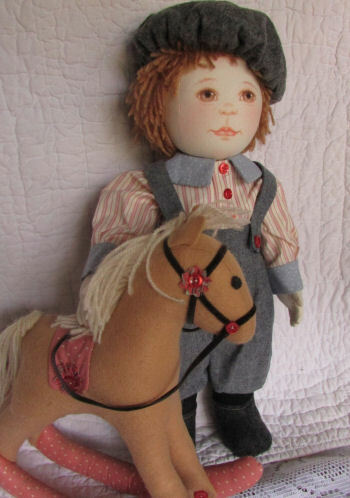 Milo (18" Doll) with Rocky (12 " Rocking Horse) are the original prototype dolls for the classic pattern with the same name and are part of the treasured Oregon RagBabies(TM) family. Both Dolls are Original Designs and are Made by Kezi! Milo is Signed and Dated By Kezi! They are in mint condition! For More Pictures and Information on These Original Dolls Go To the Cloth Doll Market - Click HERE! 2018 Theme: Open... Any theme you desire! an Animal Doll Can Win!